Set oven control to broil. Spoon yogurt into ovenproof 6-oz custard cup. Carefully spoon lemon curd onto center of yogurt. Spray 1/4-cup measuring cup and small rubber spatula with cooking spray before measuring marshmallow creme. 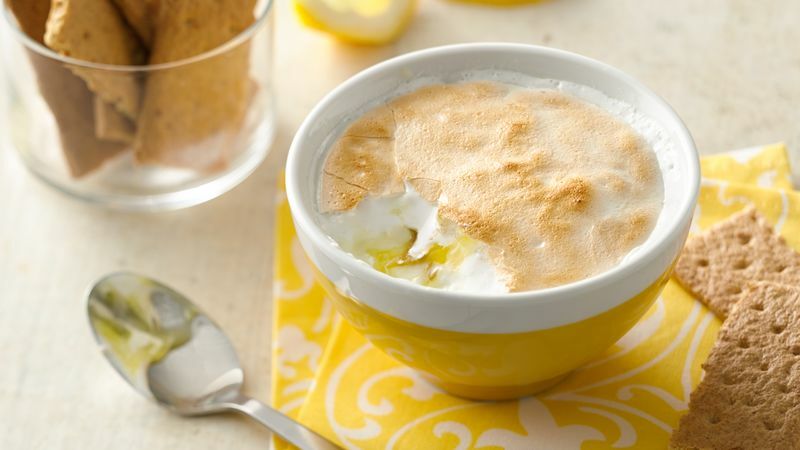 Top lemon curd and yogurt with marshmallow creme. Place custard cup on pan. Broil with top 5 inches from heat 1 to 2 minutes or until golden brown (watch carefully). Serve immediately with graham crackers. Lemon curd is similar to lemon meringue pie filling. It is made from lemon juice, sugar, butter and egg yolks. It can be found in the jam and jelly aisle of a supermarket.